Have you ever tried swimming with one arm*? I have, and it is hard. Harder than it looks. If we keep swimming with one arm, we would improve our swimming for sure but it would be tough going. Imagine how much better you would feel and perform if you were then able to use BOTH arms. Many of us are swimming with one arm. Probably without even realizing it. 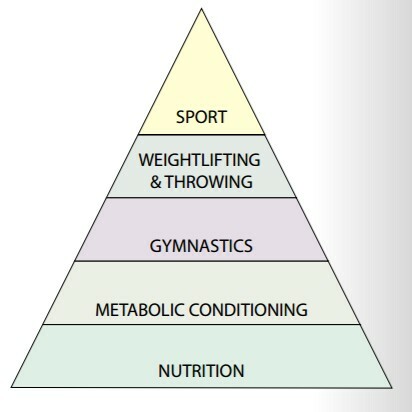 Some of you may be familiar with the pyramid that outlines the hierarchy for athletic development. Like me, you may have omitted the first step: nutrition. Nutrition is the “second arm” in our swimming analogy. Once you optimizing your fueling strategy for training you perform better and more importantly FEEL better. When you FEEL better you can bring more intensity to your training. When you train with more intensity you get better. Then you feel better about yourself. Then you have more happiness and abundance in your life. Using No Drama Fitness’ “awesomeness-based coaching” model for nutrition will get you on your way to more JOY. (!!!) You are already making strides towards improving your nutrition. You are reading this article! First thing we do is use a measuring tool to analyze your body composition over a dozen points. We use this so we can track improvement (bright spots!) and identify any underlying imbalances or areas to focus on. Then we have you log your mass, diet, and training over time so we can identify trends. Meeting biweekly, we identify your bright spots, reanalyze and make course corrections to fueling and training. 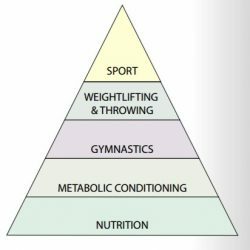 Small corrections and good habits over time raise ALL levels of the pyramid. Now BOTH arms are pulling you through the water. *this idea come from an video of Coach Glassman discussing nutrition at a seminar.